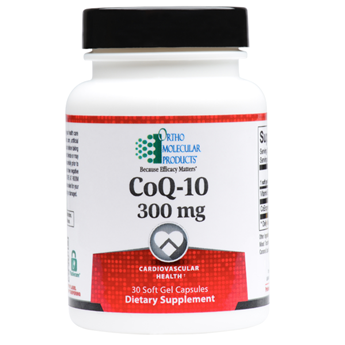 CoQ10, an essential component of cellular energy production, has been shown to extend cell life and benefit high-energy systems, namely the cardiovascular, neurological, and immune systems. Supplementation with a highly concentrated, oil-based CoQ10 enables faster recovery of CoQ10 levels for those that have increased CoQ10 requirements including those with drug-induced depletion, increasing age, or increased tissue demands. The CoQ-10 300 mg formulation is highly concentrated for those that need to quickly and effectively increase levels of CoQ10. CoQ10 300mg is delivered in a proprietary oil-based formulation and includes natural vitamin E for enhanced absorption and maximum stability.